It doesn’t matter if you’re the assistant or the CEO: Everyone gets the midday munchies. 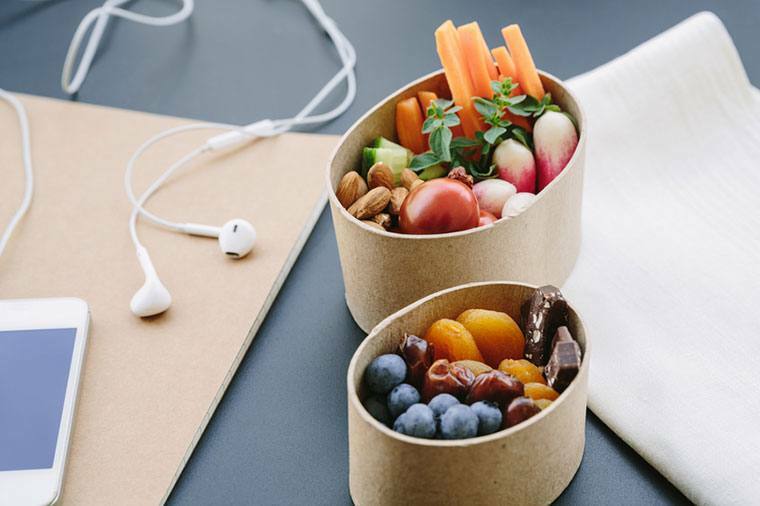 And while at home you can whip up whatever your heart desires, like sweet potato avocado toast or a green smoothie, at work healthy snacking requires a little more planning. After all, most offices don’t have a Vitamix in the kitchenette—and not all nutrition bars are actually nutritious. But like bullet journaling, it so makes a difference: The wrong mini-meal could inadvertently cause your energy to tank way before 6 p.m. So, what should you be reaching for? Here, seven super-busy wellness execs share their go-to work snacks. (With schedules like theirs, you know there’s no messing around in the fuel department.) While their preferences are all over the board, everyone’s nosh of choice is undeniably quick to make, easy to eat, and majorly good for you. Get ready to give your desk drawer a serious makeover—no chips invited. Scroll down to find out which healthy snacks wellness CEOs rely on at work. It’s no surprise that Epic Provisions co-founder Katie Forrest puts protein first when it comes to snacking. (I mean, she has built a bona fide jerky empire.) “I keep our snack strips at work and also almond butter packets,” she says. Both are perfect on-the-go options when you’re peckish in between meetings—though I wouldn’t recommend eating them together. Even fitness titans cave into sugar cravings every now and again. “I admittedly am notorious for doing a drive-by of the candy jars in the kitchen, which are full of Skittles and gummy bears,” says ClassPass founder and executive chairman Payal Kadakia. To ensure she’s got a better option at the ready, Kadakia stocks her desk with Kashi bars, peanut butter, and carrots. All have a hint of sweetness, without the refined sugar of the shared office snacks. NAO Nutrition owner Nikki Ostrower, MS, meets with people all day, so she needs her energy level to be the same at 5 p.m. as it at 9 a.m. And being a nutritionist, she knows exactly how to use food to do that. “I keep Simple Mills Paleo crackers, nut butter, chia pudding, grass-fed beef jerky, sliced veggie sticks, and leftovers from dinner all on hand,” she says. Protein, healthy fat, carbs—that’s one well-rounded snack arsenal. If you only have 30 seconds to satisfy your growling stomach—like Flywheel CEO Sarah Robb O’Hagan often does—nothing beats a banana. Other than espresso, Wanderlust co-founder Sean Hoess relies on one thing to power his day: nuts. The snack ticks off a bunch of boxes—there’s protein and healthy fat, which makes it ultra-satiating even if you just knock back a handful. Plus, they won’t go bad if you leave a tub of them in your desk drawer and forget about it for a few weeks. (Avocados? Not so much.) Added bonus: No crumbs on your keyboard. Hummus is the OG healthy snack, and it’s a favorite of SoulCycle CEO Melanie Whelan. “I put it on gluten-free crackers,” she says. Something else you’ll find in her desk drawer: dark chocolate-covered almonds, for those times she’s craving something both savory and sweet. Having a well-stocked snack stash is key, but you still need lunch. Here’s how wellness influencers shake up their salads. Plus, what to eat on those busy nights when you don’t get home until after 9 p.m.